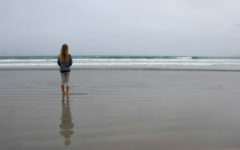 At the start of this year I had big dreams for this blog. 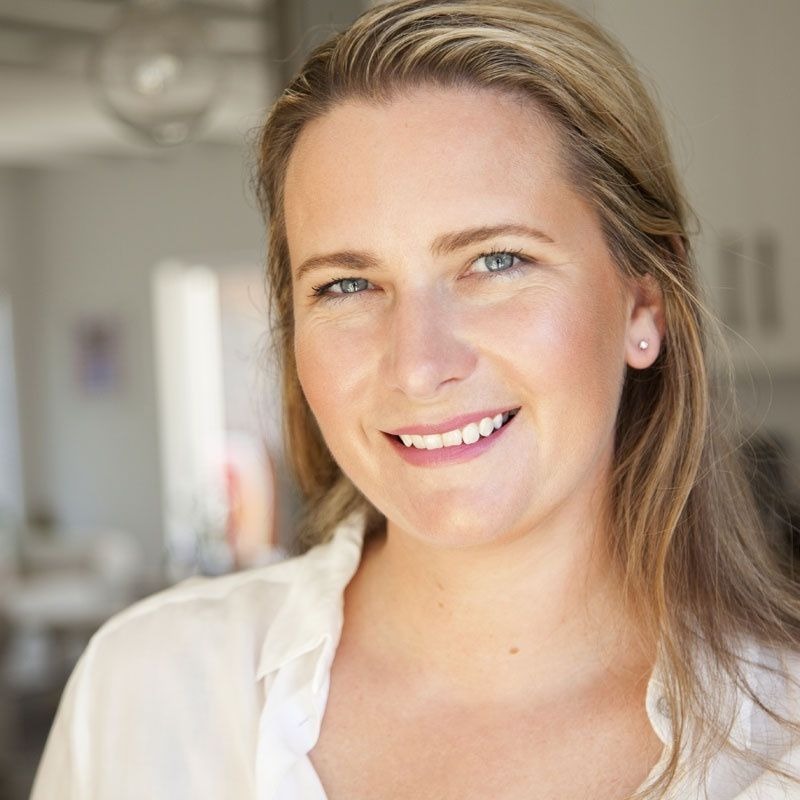 I remember speaking to a friend and saying how I would love to leap into doing more international trips and travel stories. I wasn’t quite sure how I would make that happen from my pin prick existence at the very edge of South Africa, but I put it out there! 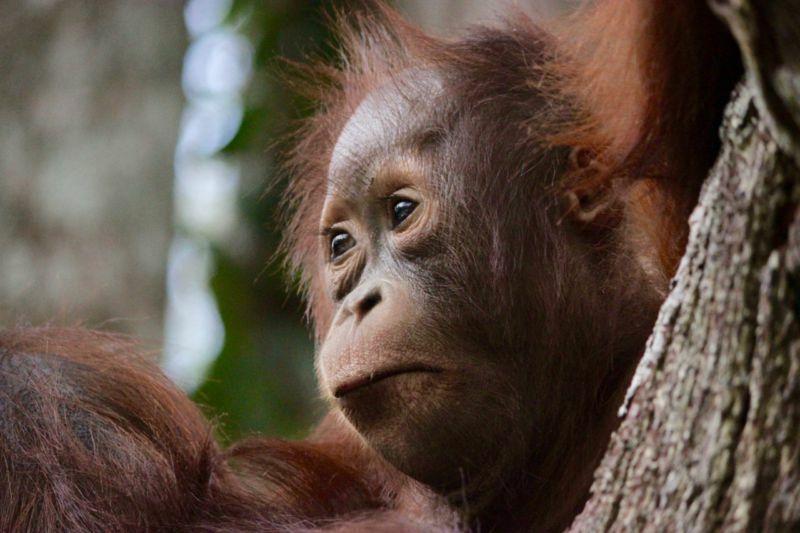 And then, in early August, I found myself heading deep into the jungle of Borneo on board a traditional Indonesian boat known as a Klotok. Never in my wildest dreams did I imagine that I would find myself floating on a boat in a far flung corner of Indonesia. 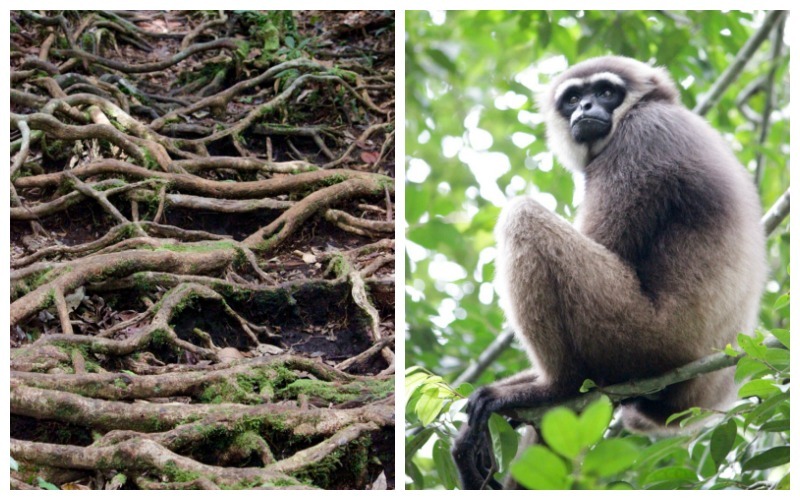 It was straight out of a dream….. or The Jungle Book! 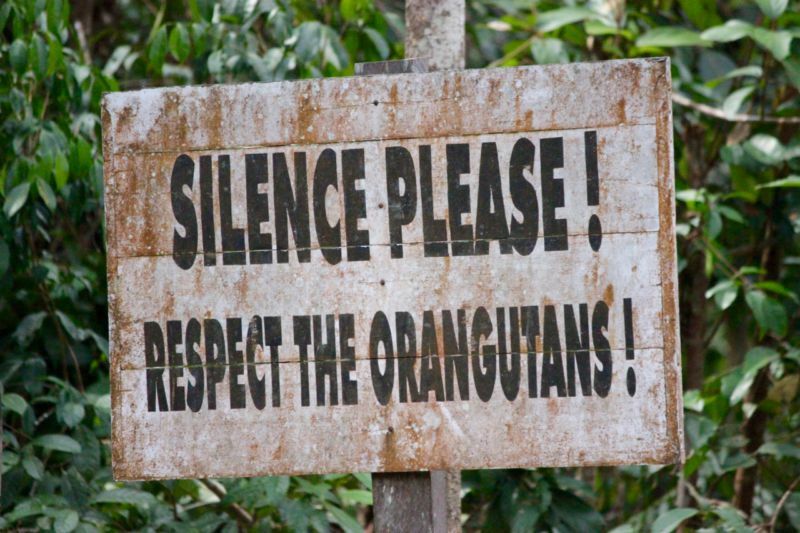 The reason I found myself here was to find the most famous inhabitants of this part of the world… the orangutans!!! So we set off, across the large expanse of the Kumai river and down it’s tributary, the Sekonyer River, for two days. The first few hours of our time on the boat were spent relaxing on the sun loungers on the deck, reading travel books, eating traditional Indonesia fare and soaking in the silence of nature at it’s most wild… Finally, a few hours later, our Klotok pulled up alongside an array of other boats and hitched us together. It was time to discover what we had come all this way for! 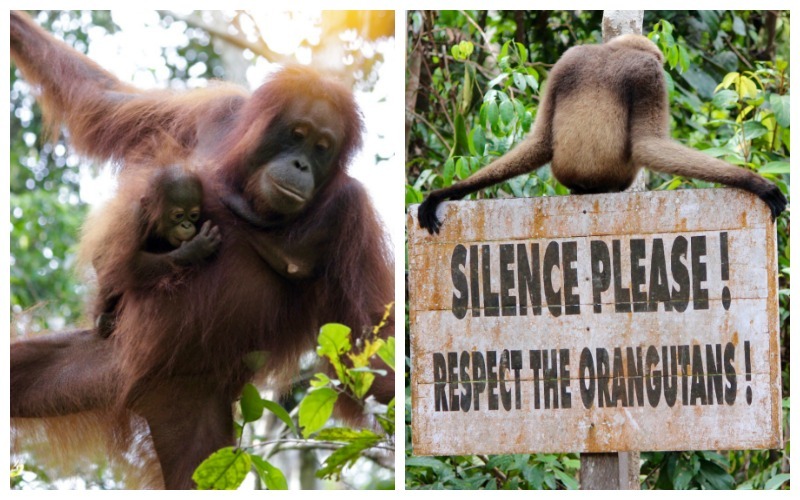 The rainforests of Borneo and Sumatra are the only places in the world where you can see the giant orange apes. 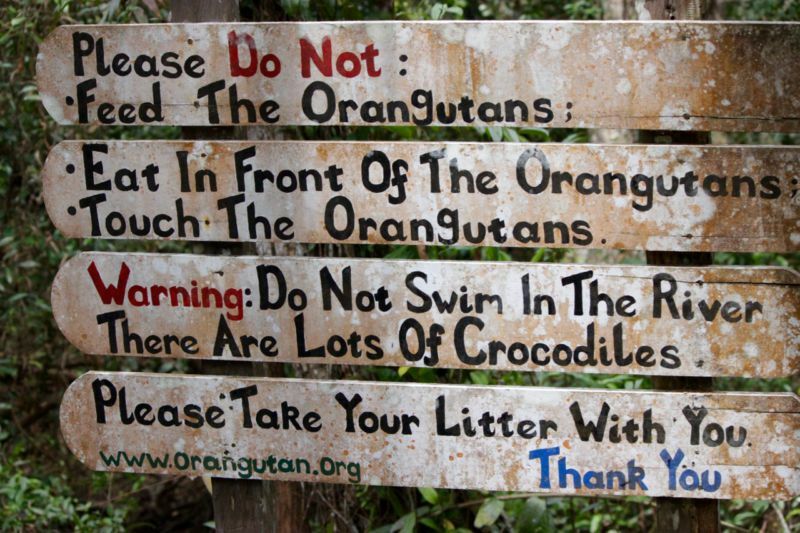 This is a bucket list destination for hundreds of people around the world who care deeply about their conservation. 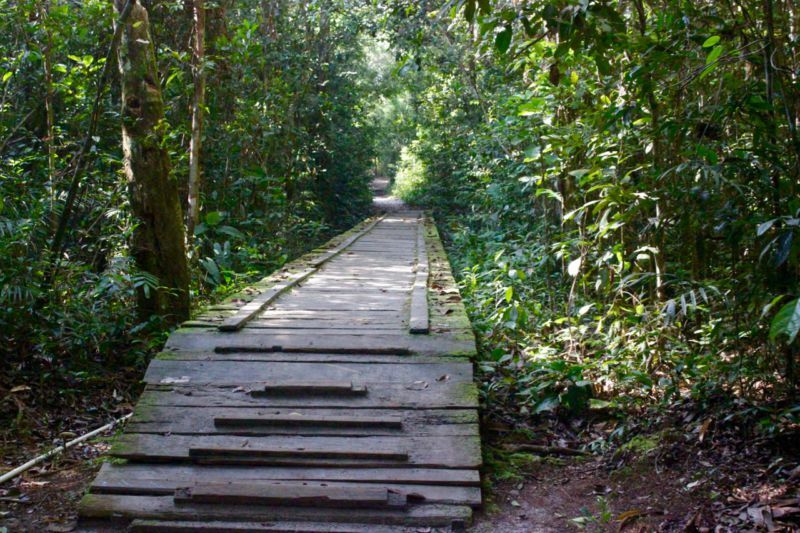 Not knowing what to expect at our first stop, we all walked silently in single file along a path that cut through the dense growth of the jungle. We had to be extra careful to remember to watch where we were placing our feet as we kept our eyes upwards hoping to catch our first glance of these magnificent creatures. In the trees over our heads we spotted our first flash of orange… (startling more orange that I had expected). 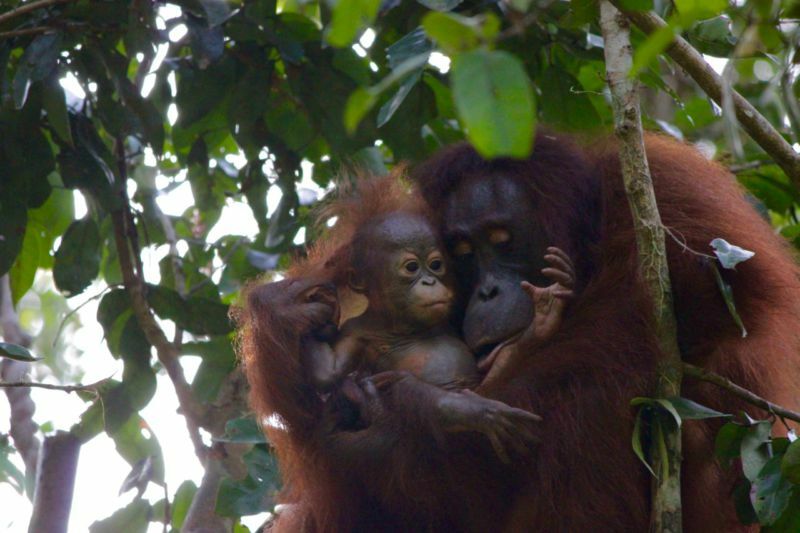 A large orangutan casually hanging from one arm… and, clutching to her chest, a baby!! I scrambled for my camera, desperate to capture the moment, only to realise that technology was going to let me down at this exact moment! Trying not to panic I packed my camera away and just absorbed the moment. 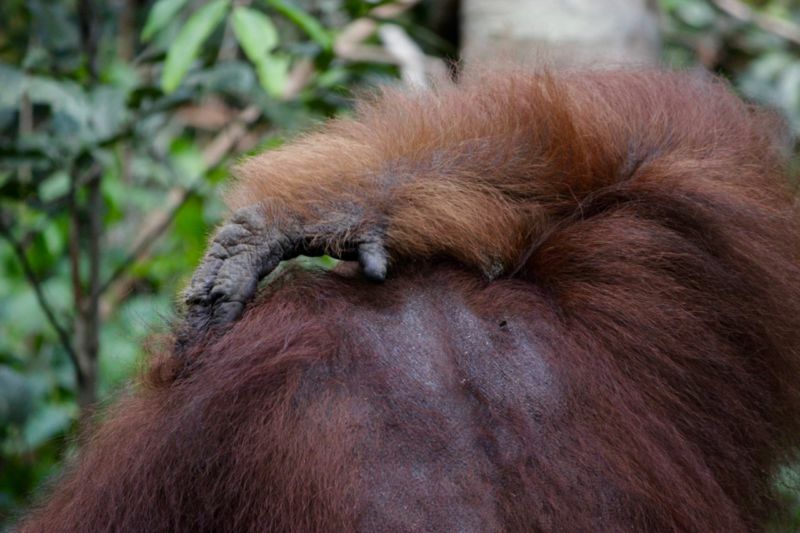 Locking eyes with a great ape was incredible. A moment of genuine warmth and connection – although whether she felt the same is up for debate! 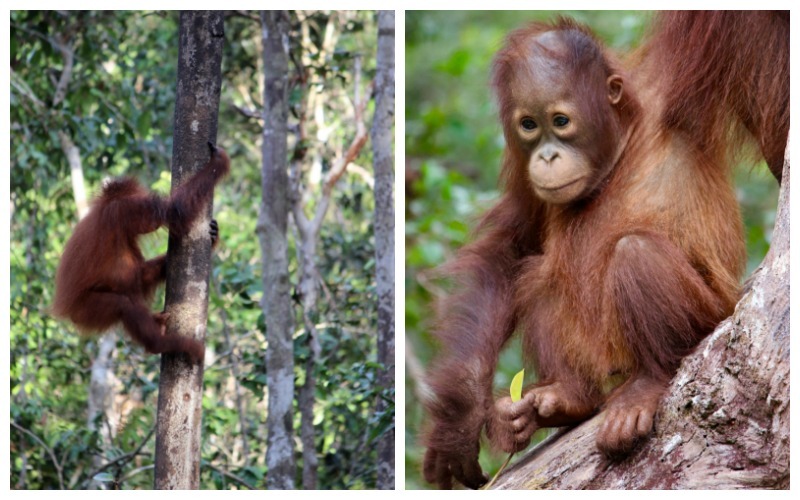 On our visit to the area we would visit 3 different orangutan camps: Tanjung Harapan, Pondok Tanggui, and Camp Leakey. 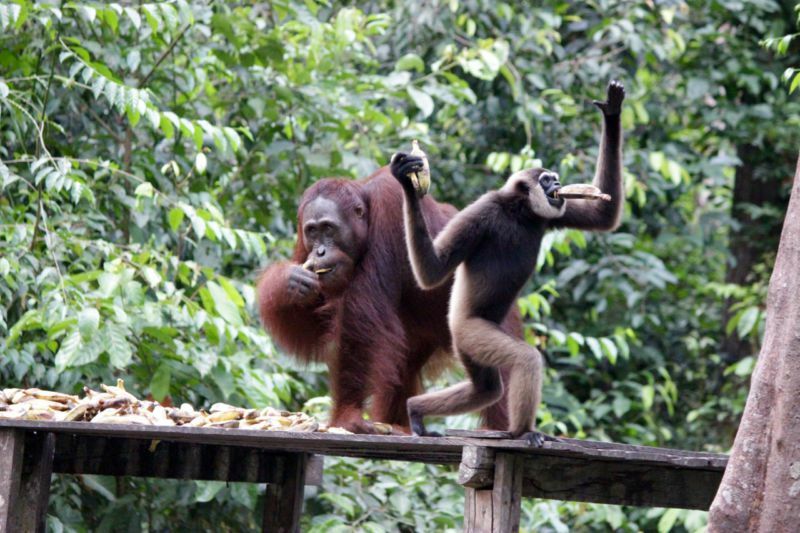 Each camp is dedicated to rehabilitating ex-captive orangutans and to aid the conservation of wild orangutans. 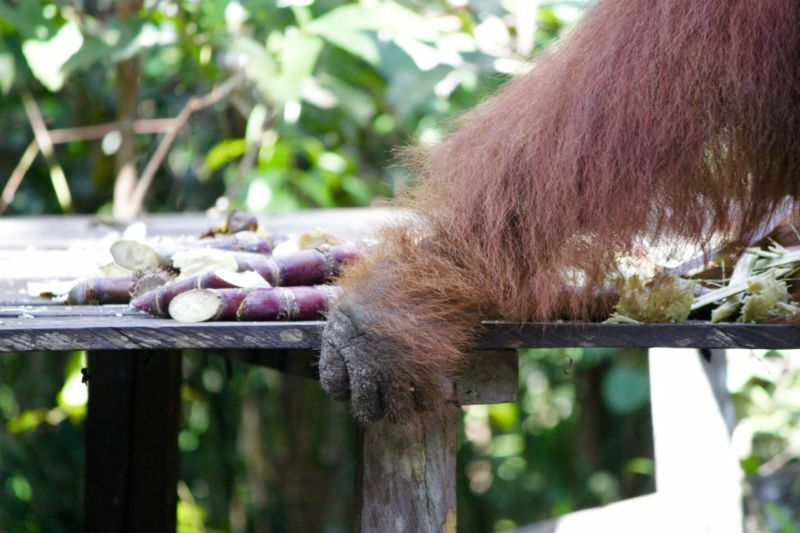 The orangutans who live in these trees are free to roam in and out of the camp areas as they please but they do enjoy the convenience of a “take-away” buffet that is provided once a day where they can breeze in for a snack, or mouthful, of bananas and other fruit! 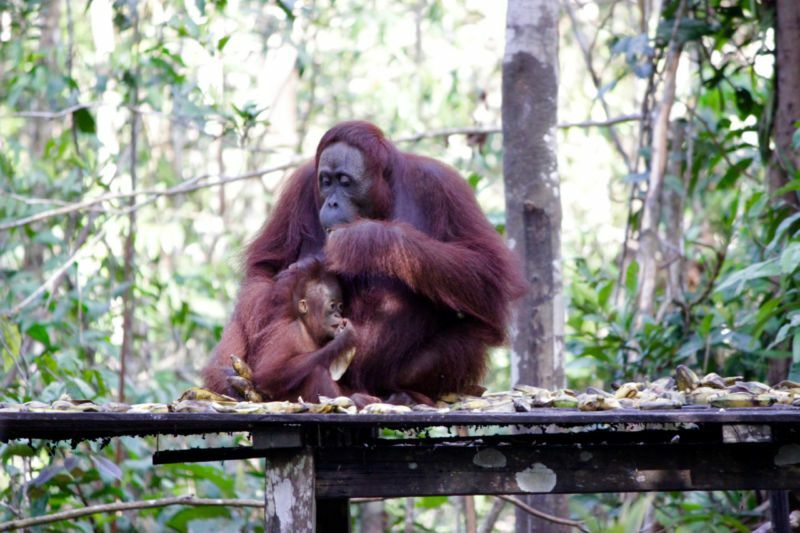 After our first encounter, we moved on to the first feeding area and awaited the presence of even more orangutans. 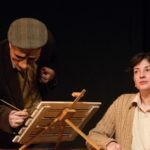 And then they came…. 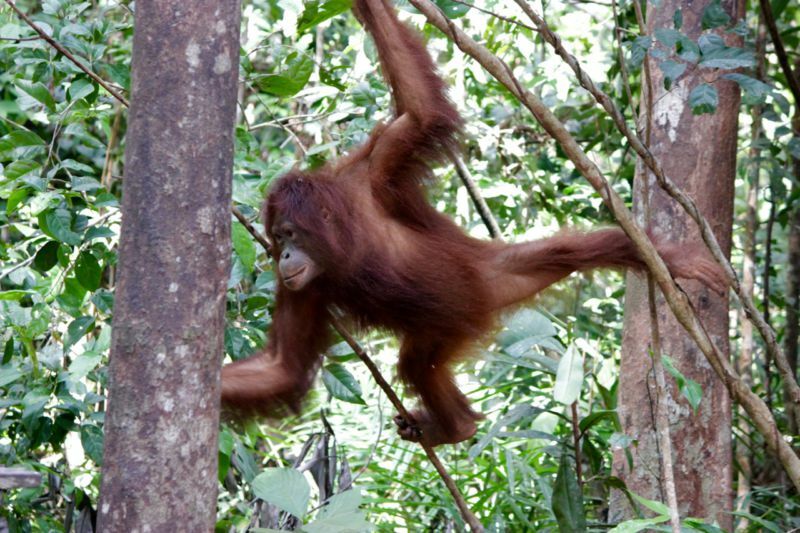 Skilfully swinging from branch to branch through the treetops, branches bending and and bowing beneath the animals’ great weight. 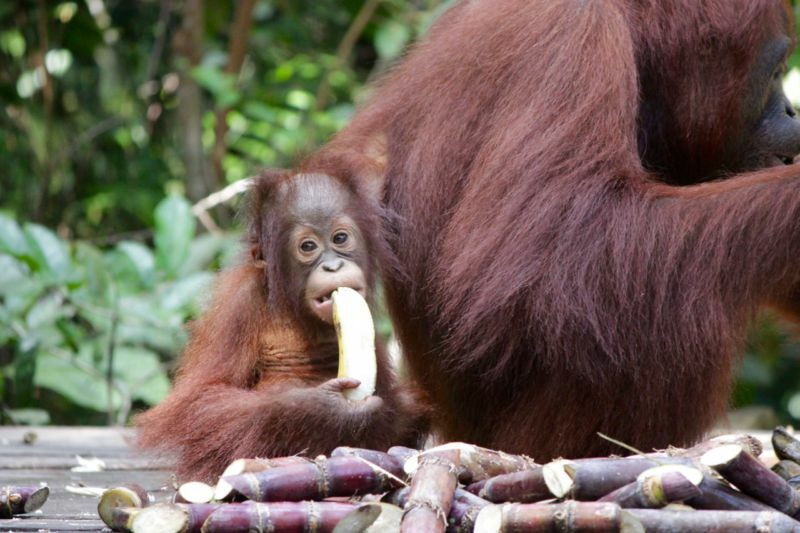 There were adult females, “teenage” youths and a few babies and toddlers of various sizes. Each took their turn at the table, a few sneaking in an extra supply for later! The next morning we headed to the second camp where our patience paid off in a big way…. 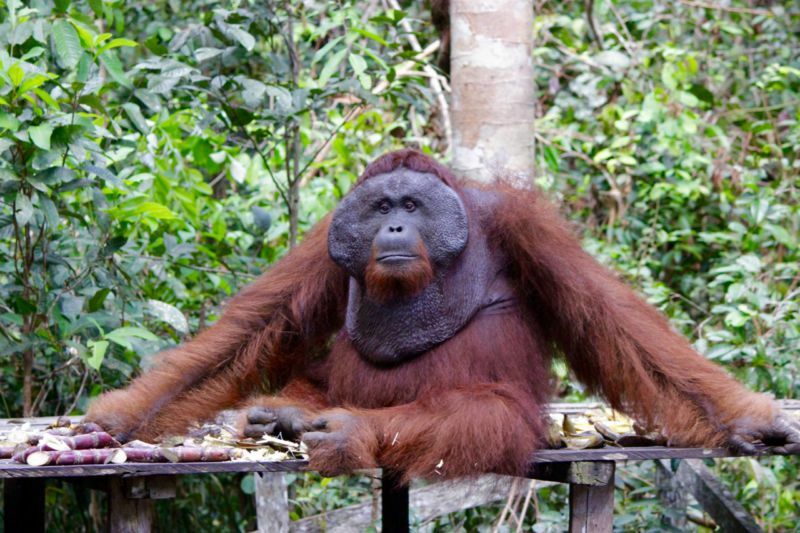 A huge adult male orangutan came for breakfast and quietly chomped his fill while keeping his back to his audience. His broad shoulders, strong hands and powerful reach on full display… and then he turned around to reveal his impressive cheek pads and probing eyes. Another chance to wonder at what thoughts were crossing his mind! A group of tourists touting cameras must surely be an amusing site from the other side. 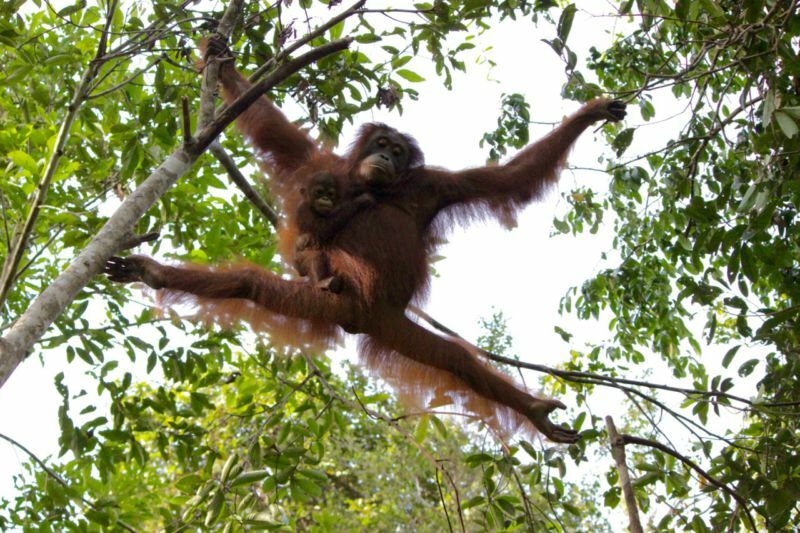 Orangutans misjudging the distances between the trees and how far the branch they were on would actually reach… resulting in the need to swing around again and try to grab the next branch! 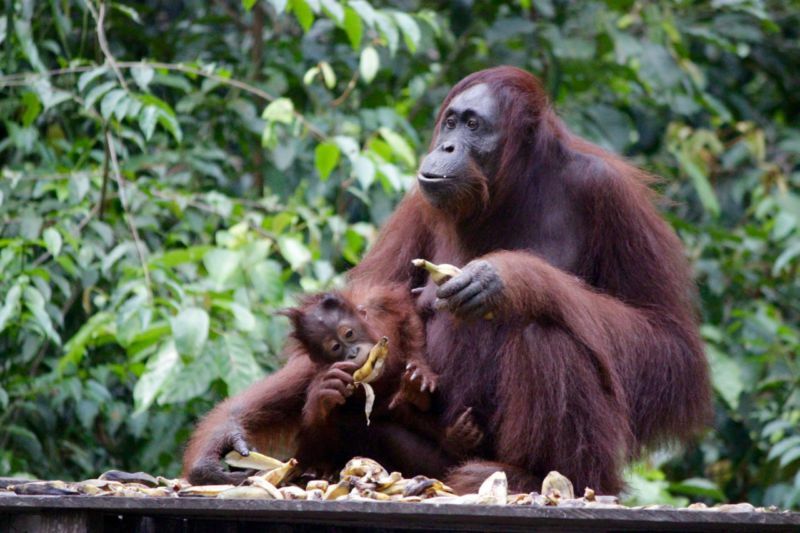 A family of orangutans sitting down to eat – dad, mom and baby – while the younger “teenager” quickly breezes in, grabs his food and heads back up to his “room” in the tree tops. A rather resourceful adult shoving as many bananas as possible into both hands AND his mouth before feeling the scene of the crime! A cheeky gibbon making a quick turn past the table knowing full well he wasn’t welcome – his long limbs making for a classic picture! 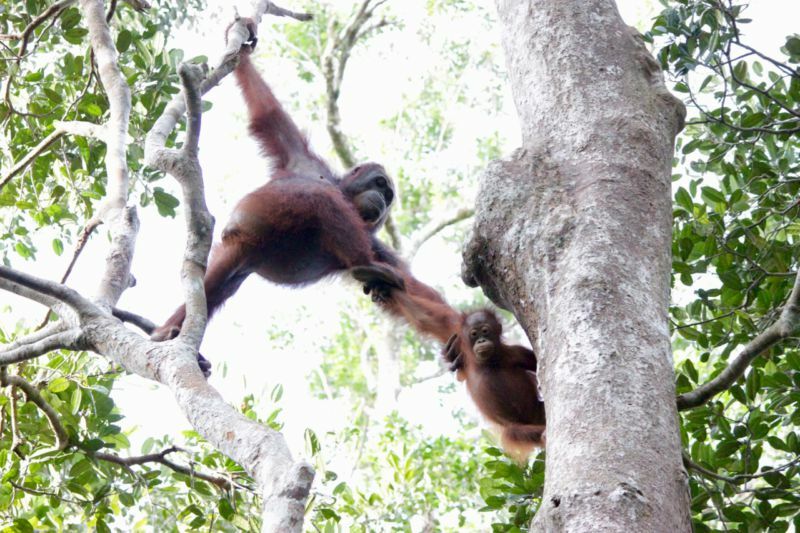 A mom trying to get her baby safely from one tree to another and grabbing it by it’s arms to pull it to safety. A near miss “bomb drop” from above our heads that landed just a few feet away from us with a very loud thud! It most definitely would have knocked you to the ground had you been unfortunately placed beneath it’s gravitational path! 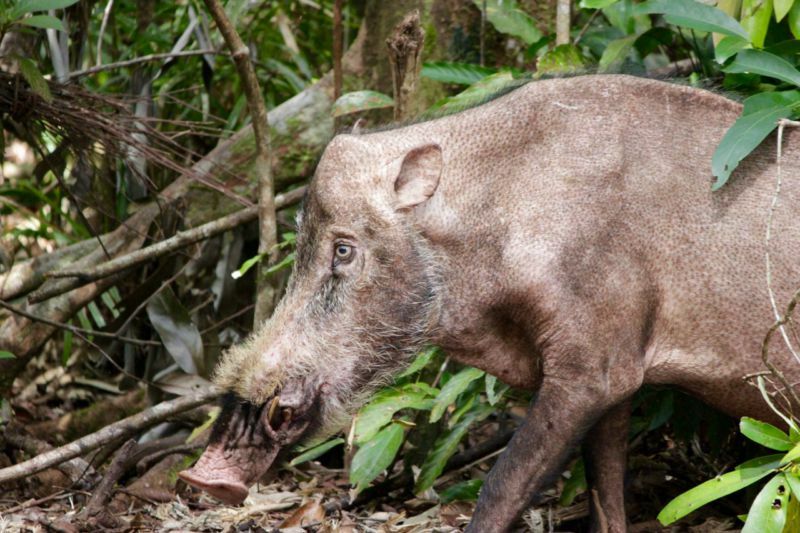 A visit by an opportunistic wild boar hoping to find some cast offs to fill his tummy. Flights from Jakarta to Pangkalan Bun, Kalimantan are about 1 hour long. 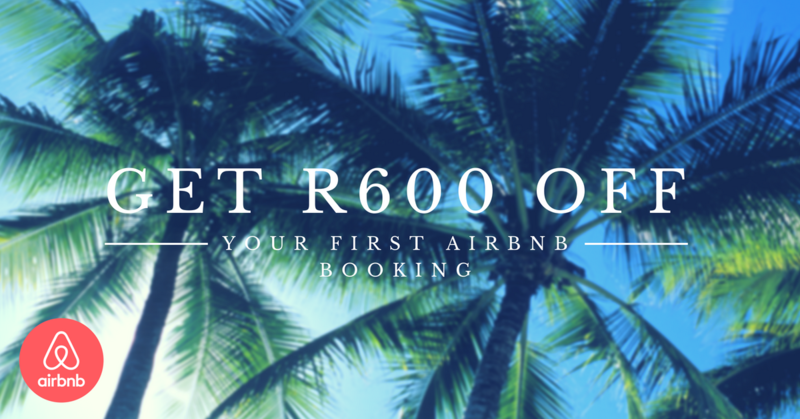 Prices start from around R1500 (approx US$100) return depending on the airline and when you fly. Airlines that fly to Pangkalan include Kalstar and Garuda but you can also search and book via Skyscanner as they have all the local airlines listed and you can compare the prices. Flights from Jakarta are generally cheaper than from Bali. If you arrive one day before the boat tour leaves, or want to rest for one night before catching your outbound flight, you might need to stay one or two nights in Pangkalan Bun town. We stayed at the Swiss Bellinn Hotel and it has a shower, comfy bed and good breakfast. 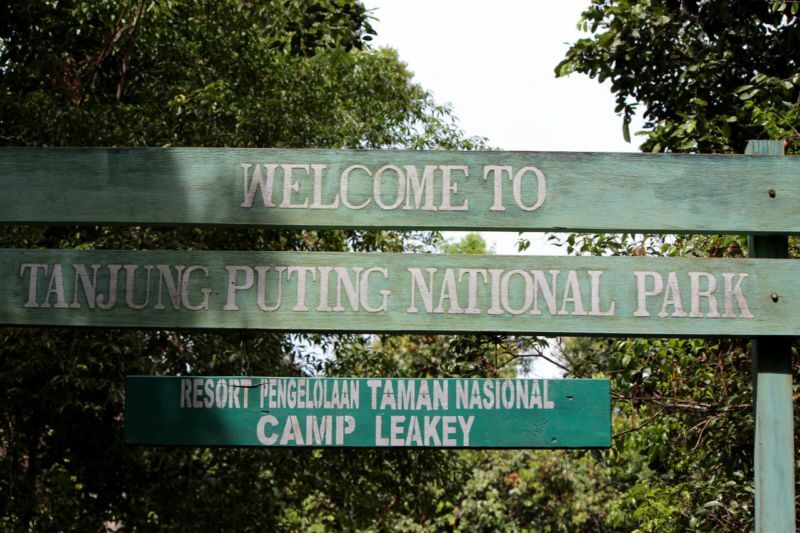 You are only allowed to enter in the Tanjung Puting National Park accompanied by a local, certified guide. At the airport you can ask for info on tours at the tourist information desk but it’s recommend that you book everything in advance. 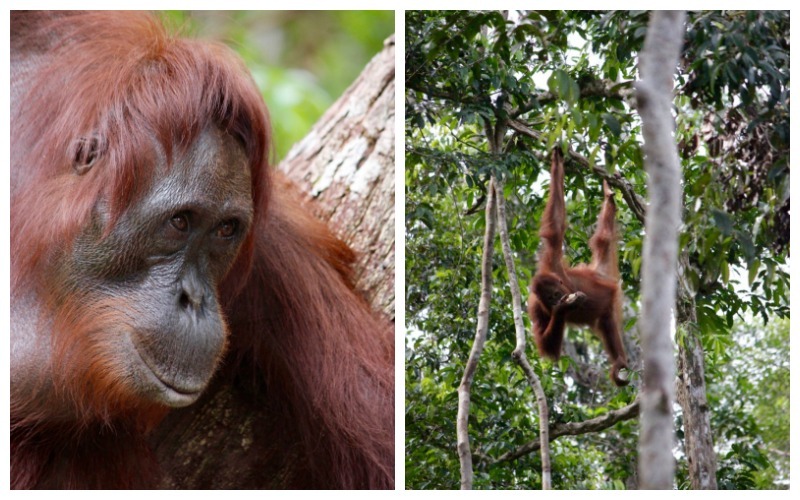 Our Klotok boat cruise and orangutan visit was with Orangutandays. They run trips from 1 Night 2 Days to 3 Nights 4 Days in length and you can choose the length of your trip according to your budget and ability to rough it! Prices start from R2800 (approx US$200) depending on how many people are on board the boat. 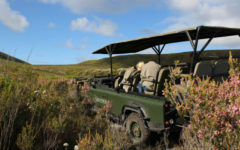 All tours include transport from the airport, accommodation on the boat, three traditional Indonesian meals per day, snacks and drinks plus the guides and the camp entrance and ranger fees. 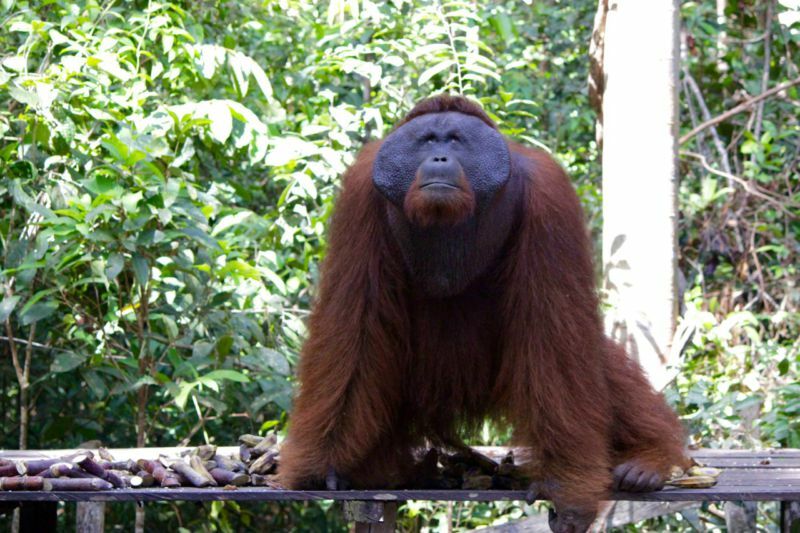 It’s really great to go with a guide as they explain all about the orangutans and their habit, the climate, the river, the work at the camps as well as pointing out the local plants, trees and the history behind each conservation center. 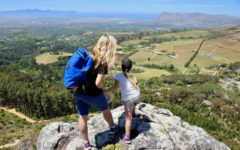 A good guide and responsible tour company are essentials when travelling to this part of the world. 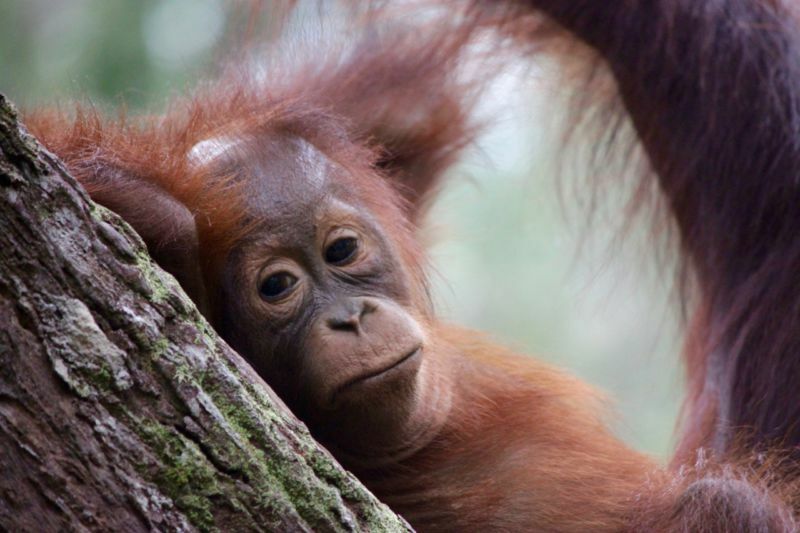 Orangutans are the most arboreal of the great apes and spend most of their time in trees where they construct elaborate sleeping nests each night from branches and foliage. 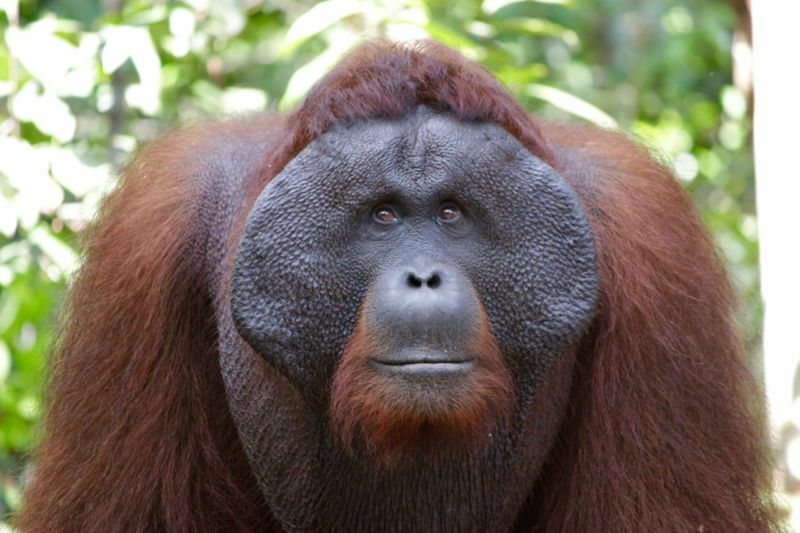 Dominant adult males have distinctive cheek pads and produce long calls that attract females and intimidate rivals. 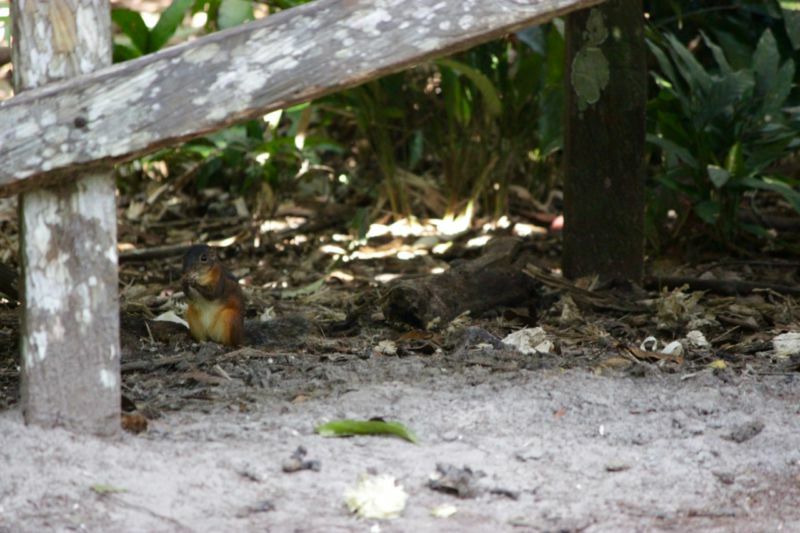 Younger males do not have these characteristics and resemble adult females. 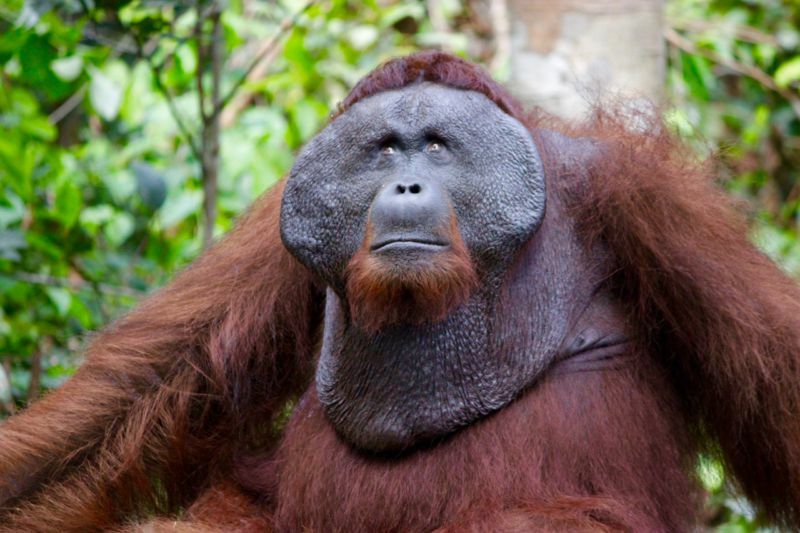 Orangutans are the most solitary of the great apes. 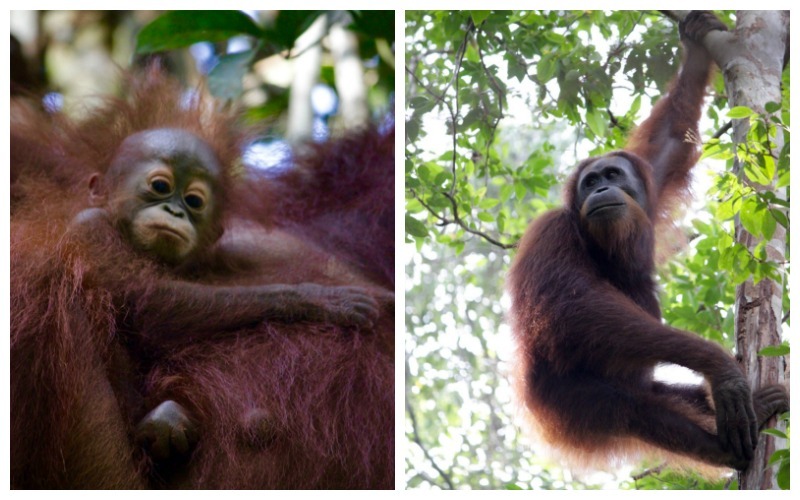 Babies live with their mothers for the first two years of their life. 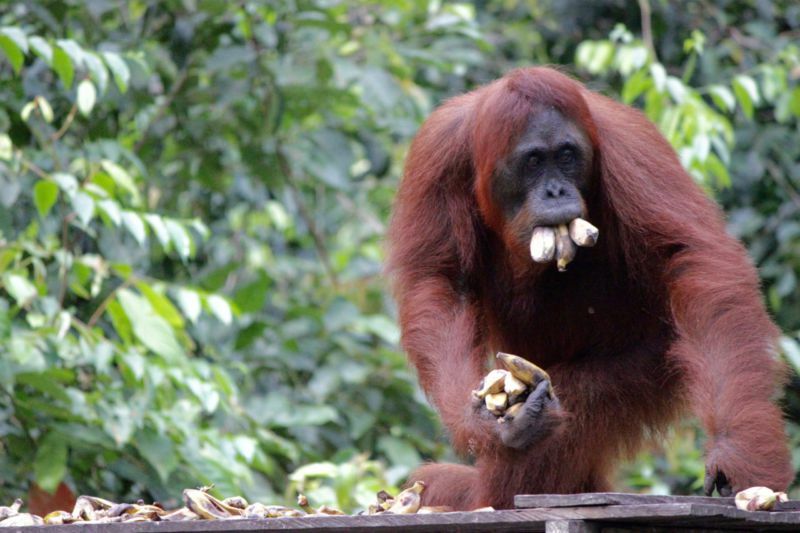 Fruit is the most important component of an orangutan’s diet; they will also eat bark, honey, insects and bird eggs. 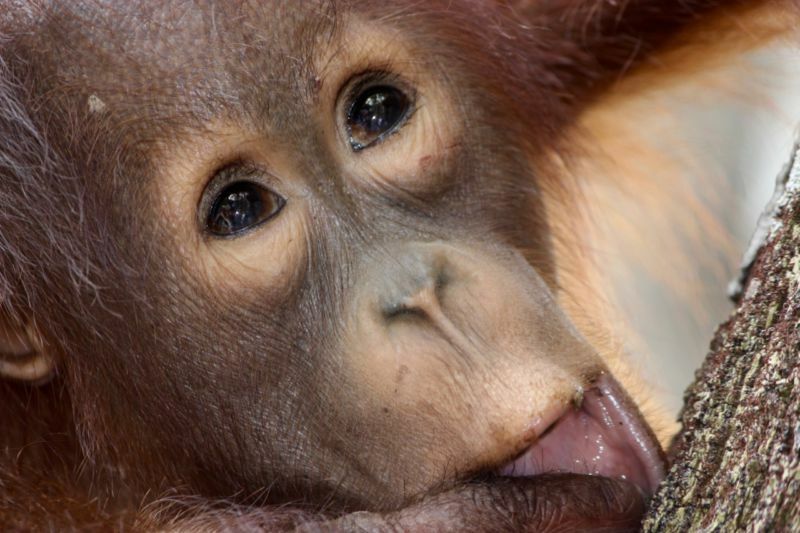 Orangutans can live over 30 years in both the wild and captivity. 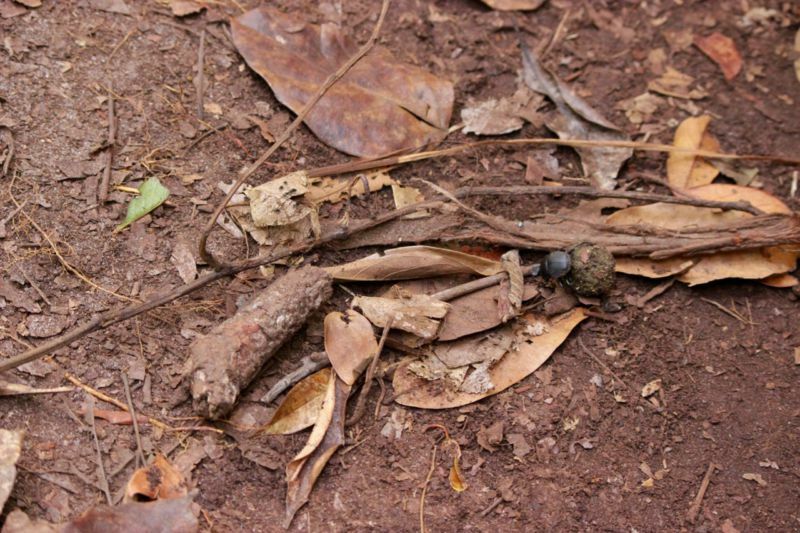 Human activities have caused severe declines in the populations and ranges of both species. 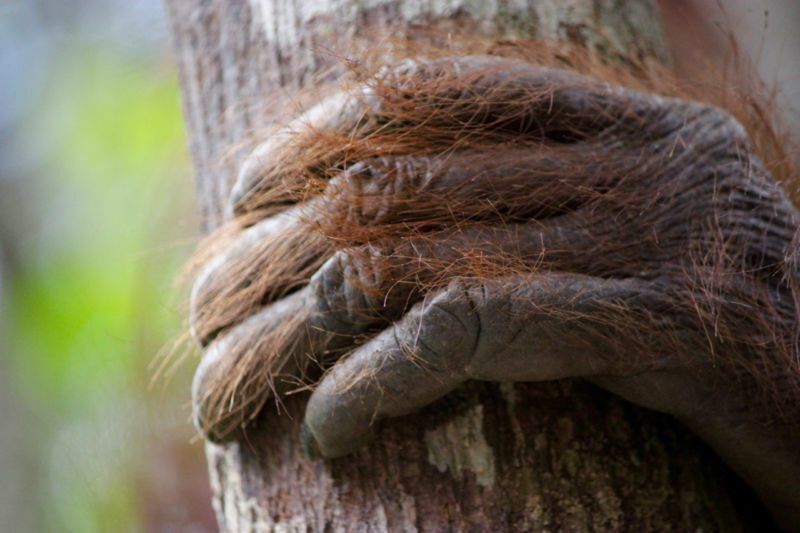 Threats to wild orangutan populations include poaching, habitat destruction due to the palm oil industry, and the illegal pet trade. A beautiful day spent at a Balinese home -cooking Balinese food and ploughing the rice paddies! 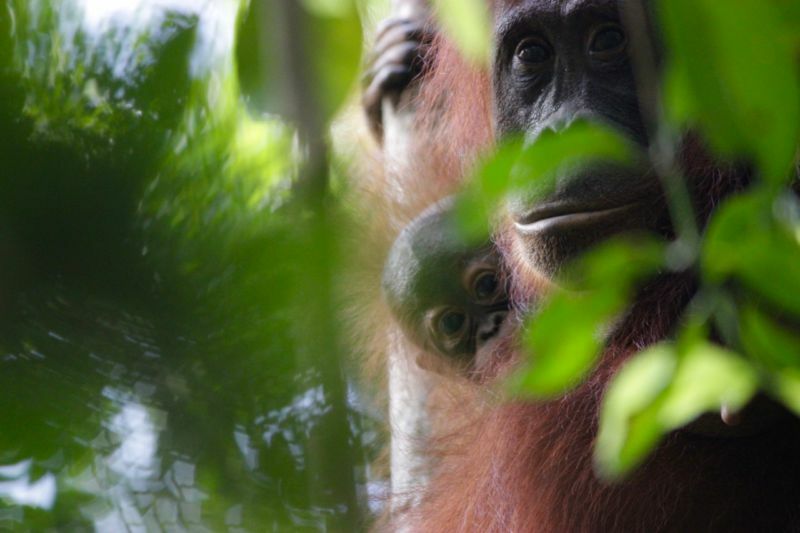 Find out more about where to see Orangutans on the Malaysian side of Borneo or visit them at Gunung Leuser National Park in Sumatra. 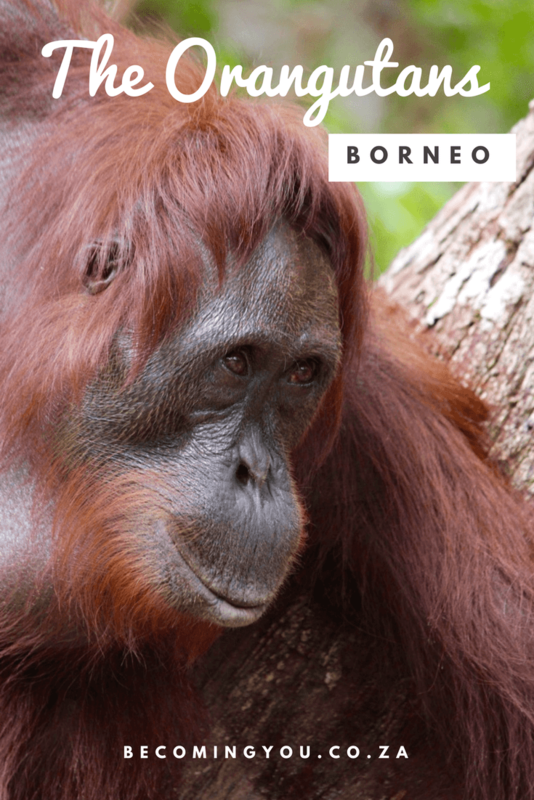 If you enjoyed this post please consider pinning it to Pinterest using the graphic below so you can find it again for when you plan your visit to see the Orangutans in Borneo or so that others can find it and plan their own trip. Thanks so much! My trip to Indonesia was on the invitation of the Indonesian Ministry of Tourism as part of the Trip of Wonders. For more information on travelling to Indonesia please visit www.indonesia.travel and follow @indtravel on Twitter or Instagram and search the hashtags #WonderfulIndonesia #TripofWonders for more incredible photos from our journey. 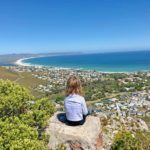 I write reviews and feature beautiful places on my blog in order to inspire others to find new, exciting and different places to visit. As always all thoughts, opinions and images are my own. This looks incredible! What an amazing opportunity to see these creatures in the wild. It really was like stepping into another world… So grateful for the experience and the trip in general. Saw so much. Learnt so much. Grew so much!